Hidden across the highlands of Northumberland are Bastle houses, relics which bear witness to a time when Northumberland was a lawless land. Centuries of border reiving back and forth between Scottish and English clans, gangs and families had left the region in a permanent state of fear. 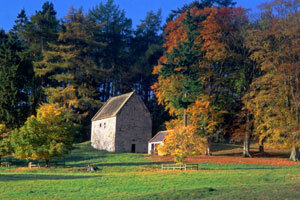 Unique to Northumberland and the Scottish Borders, these fortified farmhouses were designed to protect people and valuable livestock from robbery and violence. A classic Bastle house has walls a metre thick and small or no windows. The ground floor was devoted to stable space for the most valuable animals. The family's living quarters was on the floor above, which could only be reached by a ladder which would be hauled up at night. 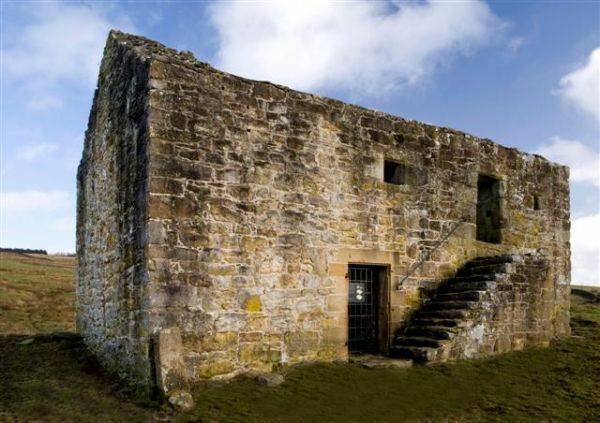 There are over 200 known Bastle houses in Northumberland. They are mainly scattered across Liddesdale, Redesdale and Tynedale - though some have been found as far south as Allendale. Sometimes you can find them hidden amongst other farm buildings, but more often they sit on their own in lonely isolation. Northumberland is awash with castles and grand estates. In fact, we are said to have more than any other county with many being built or fortified as a direct result of the turbulent times. Compared to the impressive architecture of these mighty structures, Bastle houses were often made from undressed boulders and rubble to fill in the gaps. However, with their stark and austere outlook, they all speak of a need to be strong and to survive. Much more than the castles and estates, they speak of the fear which was a part of everyday life. The name certainly has a special ring to it and the 16th century house itself does not disappoint. It was a lovely drive through Bellingham and out to Tarset near Kielder Water and Forest Park, with the house well-signposted and quite easy to find. Redesdale has a fascinating history starting with the time when the area was a royal hunting forest and then being used an access route for Scottish raids down into England. Surrounded by sheep dotted across the gnarly landscape, the location is totally isolated. Sitting quietly in the tranquil countryside, it wasn't difficult to imagine yourself back some 500 years or so to when the reivers were here. It has its own storyboard, telling you more about the history of the area, and a viewing platform. You're on the outside looking in, but a good introduction to Bastle houses. High above the lovely village of Catton near Hexham sits Housty Bastle house. Dating back to the early 17th century, it shows that there was still a need for protection even after the union of Scotland and England in 1603. Indeed, records show that whilst the union did bring about the decline of reiving, mosstroopers and horse thieves were active throughout the 1600s. Yet again the setting will take your breath away. While the house is surrounded by wire and the vegetation is very overgrown, Housty Bastle is a good example of how the Bastles were sometimes mixed in with existing farm complexes. You can't go inside, but almost! Down a small country lane sits Nine Dargues. A weathered notice suggests that at one time this was being considered as a potential conversion for a hostel confirmed that we were in the right place. Overall, it’s a relatively small house. In classic Bastle house style, the walls are over 1 metre thick and along with the other defensive structures you can see that even in a quiet and remote part of Allendale there was a need for protection. The best part is you can walk in and explore it, allowing you to be transported back several centuries. The roof has gone and the walls are crumbling, but there is an intrinsic peace and beauty to the area. For inspiration on what to do in the Scottish Borders, check out our 3 Ways to Explore the Scottish Borders blogpost. Extend your trip and explore Northumberland in the dark - it is just as good with the lights off! Northumbria Byways is a privately owned self catering cottage agency with over 17 years experience offering our customers a friendly personal service.